At times, one must always opt for some simpler exercises than going out for some really heavy workouts. This can be due to various reasons. Sometimes, all you need is to preserve your calories but also be fit at the same time. Under such circumstances, it would be a lot better if a person can handle the problem with the dumbbell exercises rather than going for some really sweating things. However it is astonishing that with a dumbbell or two, one can get to perform all the sorts of exercises that wouldn’t leave out any of the body organs without getting exercised. In this regard, this article features some of the best exercises that can ever be performed with the help of a dumbbell and it is highly advisable for all the people to take a note of these benefits and also include it in the exercise routine for some really strong health benefits on the whole. The name itself suggests how this exercise is actually going to be and yes, the exercise actually resembles a farmer walking on the land with his tools. However getting indulged in this very exercise isn’t difficult at all. For this all one has to do is to simply take a pair of dumbbells in the hands and then get to walk to and fro like the usual farmer walking with his tools. This exercise can be done keeping a span fixed and also another important thing about this exercise is that t’s always important to keep your hands firm while walking. Doing so can get to improve the strength of your triceps on the whole. Another easiest of the exercises in the list and performing this exercise is quite simple just like the previous one. The name of the exercise itself reflects that all one need to do here is to perform squats and that too with the help of a dumbbell. Unlike the previous one, here all one needs is only a single dumbbell and you have to hold the dumbbell with the help of the dead weight. However the position in the figure can get to thrash all your queries if you’re actually confused with the exercise on the whole. A person doing around ten squats a day can be toned better and also the number of squats depends solely on your personal requirement and also the physical conditions of a person as well. However one must always remember that this particular exercise perfectly suits those who wish to get indulged in some of the simplest dumbbell exercises. Another simpler exercises in the list and this is just similar to that of the previous squat exercise and the variation would be a bit in this one however. 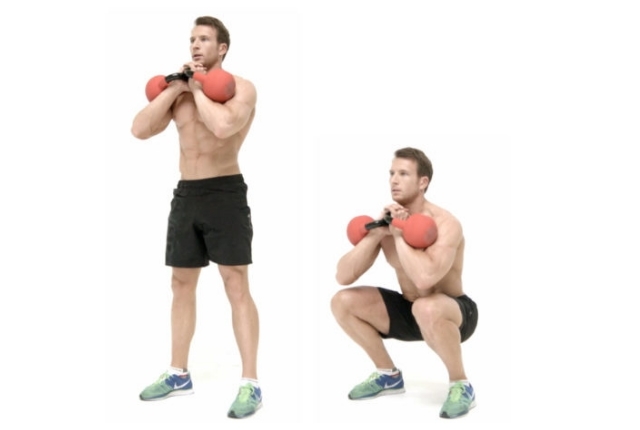 One observation in this exercise is that you require two dumbbells here unlike goblet squat and the name unleashes the way you’ve to place a dumbbell. However if a person has a bit of queries regarding the position, he can simply refer to the figure posted below. Here all one has to do is to take two dumbbells in your hand lift them up just as you lift your barbell. Then proceed further to perform squats like the usual. This exercise can get to burn many of your calories, however it can be considered as a worthy exercise for some really strong body posture on the whole. 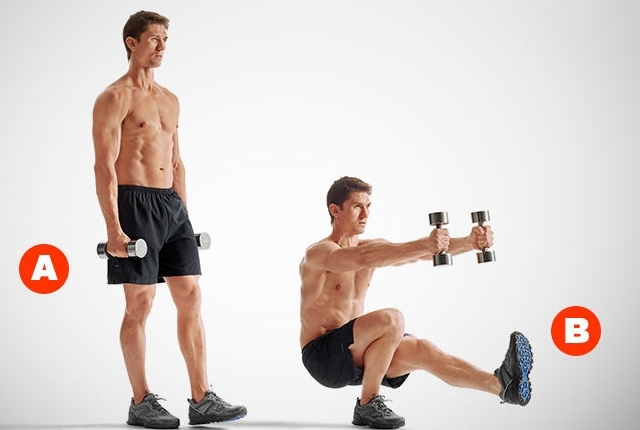 This is yet another dumbbell squat exercise and this exercise can get to train your entire body quite easily and this involves the working out of triceps, legs and all the other muscles as well. However it’s a bit complicated one when compared to the previous one and here all one has to do is to simply get to indulge in the exercise by posing in a way shown in the figure. 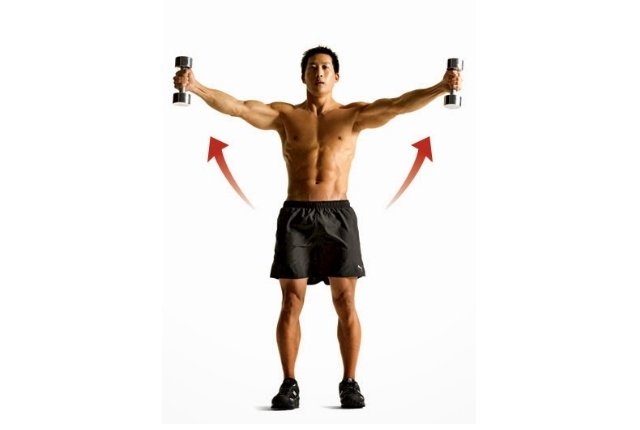 Then you have to hold your dumbbell in the forward direction such that your hands are actually parallel to the ground. Later, you have to proceed to perform squats like the usual and the count can vary depending upon the interest of the person. However it is obvious that a person chooses this exercise in order to attain flexibility as well as perfect strength and therefore, it can be considered as an overall body workout exercise and can be done just after warming up all in all. 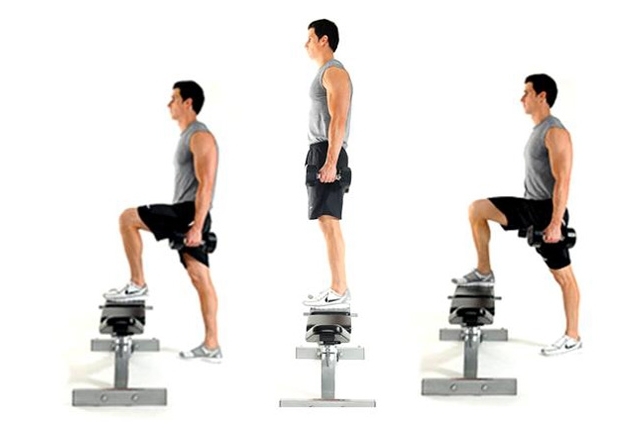 The name itself suggests that in this exercise you have to move your dumbbells in such a way that it crosses your body. In other words, movement of the dumbbells must be in a way opposite to the hand i.e you have to move the dumbbell to the right right side if the dumbbell is of your left hand and vice versa. 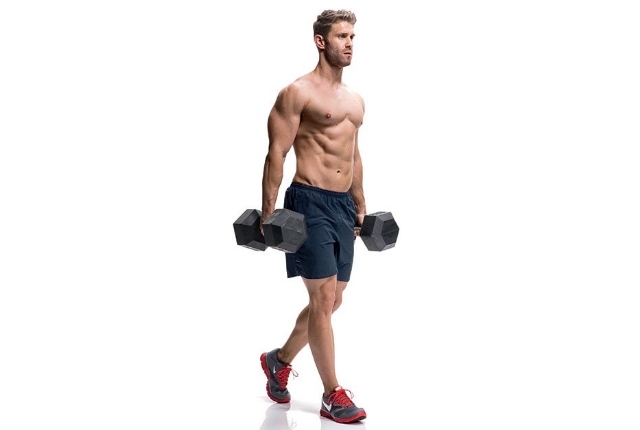 The most simplest of all the dumbbell exercises of the list and here all you’ve to do is to simply step up and down of a step that is placed in front of you and this exercise must be performed more number of times when compared with others for some better benefits on the whole. Have you ever depicted a bird flapping its wings? The same way this exercise has to be performed but there’s just a little alteration. here you’ve flap your hands in the direction as pointed in the figure and this would be something similar to that of a bird. This exercise can also be called as the Bulgarian Split Squat exercise and this is something that looks a bit complicated but it’s easy to perform this particular exercise without any sort of difficulty. Here all you have to do is to simply position yourself in such a way as shown in the figure and proceed to perform squats. This is one such an exercise where barbell can be considered as the most preferred one over dumbbells. 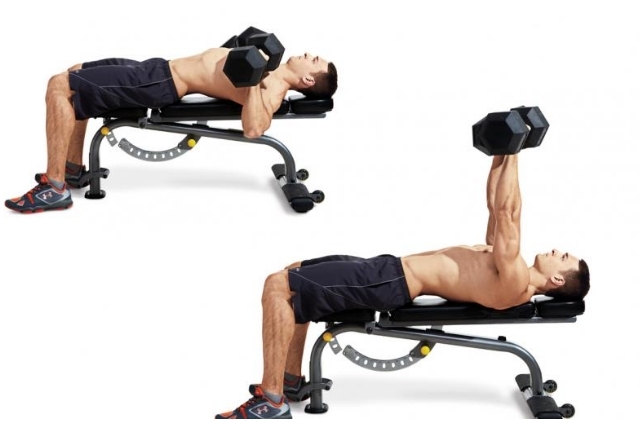 However, it can also be easily performed using dumbbells and here all one has to do is to simply get to lift the dumbbells by resting yourself on a bench.